Even though St. Augustine CHS has a short history of only fifteen years, it has earned itself a distinguished reputation in the York Catholic District School Board as a strong academic school, earning high grades in the grade nine EQAO mathematics and the grade ten OSSLT. Our school has been named after one of the great teachers and leaders of our Catholic Church: Aurelius Augustine or St. Augustine of Hippo. St. Augustine was blessed with a brilliant mind and was a prolific writer who worked on subjects such as grace, the Trinity, the soul, and more. His work has had a profound impact on our Catholic faith tradition. The school has also received accolades from The Fraser Institute as one of the top four percent of schools in Ontario in terms of student performance. Notwithstanding these results, the school has a broad range of athletic programs for its students, a robust array of clubs, committees, and activities that students can be a part of to enrich and broaden their high school experience. St. Augustine CHS prides itself on a strong integration of technology in the school curricula. Our innovative Laptop Learning Program provides a rich opportunity for many of our students to enhance, extend and apply their learning using state of the art laptops in their core subject areas. Our school has many SMARTboards and teachers who integrate their lessons using this technology and others to provide meaningful and engaging learning experiences for our students. 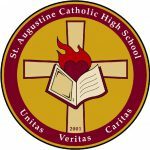 Our school welcomes you to the St. Augustine Catholic High School website. I hope you will find our site easy to navigate as well as informative and helpful. I believe you will find our school to be filled with talented young people, a staff second to none who inspire, challenge and offer rewarding educational opportunities to our students, and a supportive parental community all embracing Jesus Christ’s call to love, hope and faith. Regular School attendance is critical to being successful in high school. STAU has over 85 sports & clubs offered throughout the year! Our Library has access to many digital products: over 250 e-books and 30 databases (free to students). Our cafetieria has hot & cold lunches served daily. All students are assigned an individual locker.